Here you will get detailed difference between QHD, FHD AND 4K. Mobile screen resolution is becoming huge revolution with the dynamic and drastic change within the smartphone industry is unstoppable. In today’s modern era of smartphone world, the main consideration of any user while buying a smartphone is resolution. Resolution can be termed as measuring the size of mobile screen. Like we say, “A smartphone of screen size: 4.5 inches”. But technically it is slight different from the above words as it is measurement of screen in amount of pixels and not the diagonal measurement. We can also say that resolution is the number of pixels in a screen. A smartphone with high number of pixels comes with the higher resolution. A QHD stands for Quad High Definition which is four times the standard HD display. In another words, QHD is fitting of same number of pixels four times than HD giving you a better screen experience than a standard one. The pixel density of QHD is 2560*1440 pixels. 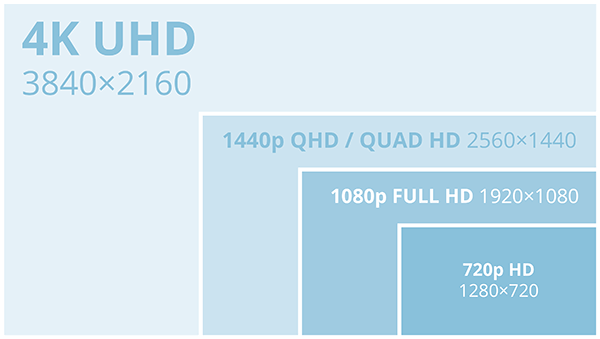 Quad HD is aka WQHD (WideQHD). FHD stands for Full High Definition display which is the lower version of QHD with a pixel density of 1920*1080 pixels used in most common laptops, PC’s and smartphones. FHD is defined as the standard for HD displays and resolutions in terms of image quality and sharpness. A “true” 4K resolution is the one which has a density of 4000 pixels used in digital cameras, cinematography & cinemas. 4K resolution has two types : 4096*2160 & 3840*2160 pixel density which is slight more than Ultra HD resolution. Multiplexes use 4K for their theater, Now 4k also coming in Television. Used In T.V, Screens, Monitors, phones etc. T.V, Camcorders, Screens, monitors etc. Digital cinemas, cameras, cinematography, T.V, Mobile phones. With countless smartphones, PC’s, tablets and screens available in the market, with different screen resolution & size, no one ever thought of the differences between the types of resolutions. Also, it does not matter to common public and the though remains in mind is what the hell do any of them mean? But trust me! it’s worth to have knowledge of everything around you. In addition, mobile phones, screens are the latest trends in the market in which every individual would love to take interest and would like to have knowledge to be parallel with the current technologies. Comment down below if you have any queries related to difference between QHD, FHD and 4K resolution.